Wednesday (Dec. 2) at Minot State University, high school students will compete at the Department of Business Information Technology’s 18th annual Technology Day. Registration begins at 8:45 a.m. in the Conference Center, third floor of the Student Center. High schools select students for competition in accounting, business communication, business law, desktop publishing, document production, business principles, spreadsheet applications and presentation software. For instance, in one competition, participants create a spreadsheet and a chart from given data. For another, participants create a presentation of 10 slides on an assigned topic. Every school is eligible to enter one student in each of the eight individual events. “An addition this year is that as part of the presentation software segment, the students must present their presentation to a panel of judges,” Repnow said. The school with the most points for placements in all competitions will receive a sweepstakes trophy. Participating high schools are Berthold, Bowbells, Burke Central, Des Lacs-Burlington, Kenmare, Powers Lake, Sawyer, Stanley, Surrey, TGU Granville, TGU Towner, Underwood and Westhope. BIT faculty members and business teacher-education students will supervise the competition, which starts at 9:30 a.m. in Old Main. In concurrent sessions beginning at 11:45 a.m., Jarid Lundeen, Minot Tires/Tires Plus Total Car Care owner, will present “Align Your High School Life for the Future” and game-day technology tours will be given in the Dome and the Herb Parker Press Box. An awards ceremony is scheduled for 12:30 p.m. in the Conference Center. Technology Day corporate sponsors include SRT Communications, Grand Hotel, Microsoft Corporation, MSU Office of Enrollment Services, Hatfield Wass & Associates, Vertical Solutions, CompuTech Inc., Town and Country Credit Union, and First International Bank and Trust. For questions, contact Repnow at 858-3325 or jan.repnow@minotstateu.edu. Pictured: 2014 Technology Day participants. The Minot State University Program of Broadcasting will host its 17th annual KMSU Auction Thursday (Dec. 3). The auction will air live on public access Channel 19 at 6:30 p.m., with a preshow starting at 5 p.m. Bids will be accepted by phone at that time at (701)858-4019. The KMSU Auction fundraises for scholarships and equipment for the MSU broadcasting program. Past events have raised over $20,000 with 10 percent given to charitable causes. This year, that portion will be given to Project Ignite Light and Minot Backpack Buddies, which both support local children in need. KMSU promotes local businesses through various media in exchange for donations and then organizes them into packages to be auctioned off in a QVC-style format. Viewers call to place bids on air during the allotted time, with the highest bid winning the package. This unique television auction is planned, organized, produced and promoted by MSU broadcasting students. For questions, contact Janna McKechnie, KMSU Auction advisor, at janna.mckechnie@minotstateu.edu. 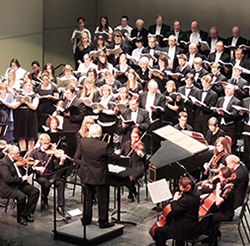 The Heritage Singers men’s chorus, the Voices of Note women’s chorus, the Minot State University Concert Choir and community singers, including high school students, will join in the performance of Handel’s “Messiah” Sunday (Dec. 6) in Ann Nicole Nelson Hall at 4 p.m. They will be directed by Ken Bowles, Division of Music chair. Each year, the three sponsoring choirs present the Christmas portion of the famous oratorio. This year marks the 106th anniversary of Minot’s first performance of “Messiah.” Admission is a free, and everyone is welcome. Proceeds from a freewill offering will go to the Joseph Hegstad Music Scholarship and the John Strohm Music Scholarship funds for MSU music students. “Messiah” also celebrates the legacies of Hegstad and Strohm, professors emeritus, who were music division chairs. Hegstad served as choral director for the Concert Choir, Vagabond Male Chorus and the Jazz Madrigal Singers. A founding member and former director of the Heritage Singers, he is credited for continuing the traditional December performance of “Messiah.” In 1992, the Minot Symphony Orchestra and MSU Concert Choir, chose not to continue with the piece. Hegstad combined the Heritage Singers and Voices of Note to sustain the perennial favorite. Strohm directed the MSU Concert Choir and the MSU Women’s Chorus for numerous years. For 24 years, he was instrumental in organizing community performances of the “Messiah,” which were held at the Minot Municipal Auditorium. For questions about the concert, contact the Division of Music at 858-3185. Minot State University's Campus Players presents “Alice in Wonderland” Dec. 9-11 in Aleshire Theater at 7:30 p.m.; the doors will open at 7 p.m. A matinee performance will be Dec. 12 at 2 p.m.; the doors will open at 1:30 p.m.
Campus Players will bring Lewis Carroll’s timeless tale of young Alice and her adventures in Wonderland to the Aleshire stage under the direction of MSU senior and Campus Players president Krys Zorbaugh. “I feel so fortunate to have the opportunity to combine my love of theatre with my affection for this classic story,” Zorbaugh said. “I fell in love with Carroll's tale of ‘Alice in Wonderland’ when I was five or six. It was probably my first introduction to nonsensical poetry and, to this day, it continues to inspire my imagination and perhaps, even causes me to see my world a little differently. To work with my peers in bringing to life all of the wonderful elements of such a classic is truly an honor." Celebrating its 150th anniversary, Carroll’s “Alice in Wonderland” is the story of young Alice (Annika Kraft) who fatefully falls through a rabbit hole and finds herself immersed in a wondrously fantastic world of clever creatures and a hot-headed Queen of Hearts (Madison Curtiss.) Lopsided logic and poetry collide with curiosity to create a surreal dreamscape filled with imaginative possibilities. Well known and beloved characters such as the White Rabbit (Krista Sipin), Cheshire Cat (Casey Feldner), Tweedle Dee and Tweedle Dum (Eric Fetske, Jaryn Homiston), Humpty Dumpty (Brenna Heupel), along with the Mad Hatter (Connor Donovan) and the March Hare (Amanda Mogen), the Red and White Queens (Rhianna Costiloe, Amanda Kraft) and more, all do their part to beguile, confuse, challenge and even guide Alice on her journey through Wonderland. This kid-friendly adaptation of “Alice in Wonderland” will delight audiences of all ages. Admission is $6 adults and $5 for seniors, students and children under 12. To make reservations, contact the Aleshire ticket box office at 858-3172. For questions about this production, contact Zorbaugh at kristine.marlow@my.minotstateu.edu. Pictured, left to right, are Madison Curtiss as the Queen of Hearts, Annika Kraft as Alice, Rhianna Costiloe as the Red Queen, and Amanda Kraft as the White Queen. Minot State University’s Department of Nursing is sponsoring its semiannual Nursing Scholarship Day on Dec. 11 in Ann Nicole Nelson Hall, starting at 8:30 a.m. Nursing students will showcase their research for fall semester. The event is free and open to the public. As a holiday charitable activity, the nursing department is collecting twin-size pillows, pillowcases and twin-size sheet sets for families staying at Minot’s Domestic Violence Crisis Center. A collection tub will be placed in the hallway near the main nursing department office. All donations are due by Dec. 11 and will be delivered to DVCC at the end of the day. For questions, contact Medalen at 858-4476 or Nicole.medalen@minotstateu.edu. Minot State University humanities and music instructor Rick Watson will present “Feathers and All: Some Ways Americans Read the Bible in the 21st Century” Wednesday (Dec. 2) in Aleshire Theater at 7 p.m. Watson’s presentation, which is free and open to the public, is part of the Northwest Art Center lecture series. In his lecture, Watson will examine how the Bible was written and compiled through the lens of modern scholarship, human language and inspiration, to offer an approach to reading the Bible in the 21st century. “How do various Americans read the Bible in various translations, and how can we clarify our understanding of these readings without attacking the one who reads?” Watson said. The Mott native teaches pop culture, Honors classes, communication arts and music history at MSU. He has been a singer/songwriter and poet in North Dakota since 1967. He thinks of his songs and poems as “High Plains Creole.” He is a North Dakota associate poet laureate. He holds a Bachelor of Science in Education from MSU, a Bachelor of Arts from Dickinson State University and a Master of Divinity from Wartburg Theological Seminary. An informal reception will follow the program. This project is supported in part by a grant from the North Dakota Council on the Arts, which receives funding from the state legislature and the National Endowment for the Arts. For questions, contact Avis Veikley, Northwest Art Center director, at avis.veikley@minotstateu.edu. Maestro Efrain Amaya will direct the Minot Symphony Orchestra Thursday Dec. 10 in “It’s a Wonderful Life,” the holiday concert of its 90th season. The concert will begin in Ann Nicole Nelson Hall at 7:30 p.m. MSO will perform pieces from the “It’s a Wonderful Life” Suite along with “Scrooge” selections. MSO will conclude its celebration of the holiday season with favorite Christmas melodies. Minot State University students, faculty and staff are admitted free with a current ID. Ticket prices for adults are $25 main floor and $30 balcony; senior citizen is $20 main floor and $25 balcony; students 12-18, $15; children, $10. Symphony patrons are invited to join Erik Anderson, music professor, for a 6:30 p.m. preconcert lecture for an inside look at the symphony program. For more information about MSO, visit www.minotstateu.edu/symphony/. The Western Plains Children's Choirs with Sunnyside DrumKidz will present "Christmas Peace" Dec. 13 in Ann Nicole Nelson Hall at 6:30 p.m. The concert will feature voices and instruments performing a variety of songs and Christmas carols. DrumKidz will join Western Plains Junior Choir, Western Plains Children's Choir and Western Plains Youth Ensemble performing individually as well as together. The concert is open to the community, and admission is by freewill donations. For questions, contact Rebecca Petrik, music education and voice instructor, at rebecca.petrik@minotstateu.edu or 858-3837. Dec. 2-3 — “Fluid Nature,” acrylic paintings by Mali Vargas, Calgary, Alberta, Library Gallery. A closing reception will be Thursday (Dec. 3) in the Library Gallery, 6:30-8 p.m.
Dec. 2-30 — “The Space Between History and Hollywood,” mezzotints by artist Linda Whitney of Valley City, Hartnett Gallery. Dec. 10-Jan. 15 — Recent acquisitions to the MSU permanent collection will be displayed, Library Gallery. Brent Askvig, professor of special education and executive director of the North Dakota Center for Persons with Disabilities was re-elected as secretary of the Association of University Centers on Disabilities board of directors. This is Askvig’s fifth year on the AUCD board, and his second as secretary and a member of the Executive Committee. Askvig, Hilory Liccini, Dianne Bossert, Linda Madsen and Evan Borisinkoff attended the 2015 AUCD annual meeting, “Growing Leaders – Driving Change” Nov. 14-18 in Washington, D.C. They joined over 600 colleagues from university centers across the U.S. and the territories. Askvig moderated the panel discussion titled “Growing Diverse and Sustainable Funding Streams” at this AUCD conference. He joined center directors from Florida, Hawaii, Virginia and New York in talking about how to grow funding through non-traditional private and public sources in the context of a university setting. Liccini and Bossert, NDCPD research associates, presented a poster, “Tele-intervention in an Early Intervention Home Visitation Program: A Pilot Study” at the annual AUCD conference. The research findings, conducted by Askvig, Steve Peterson, Liccini and Bossert, can be read in full on www.ndcpd.org/assets/teleintervention-ei---2015.pdf. Hasan Buker, associate professor of criminal justice, just completed a training program on forensic interviewing to become nationally certified as a forensic interviewer by the Gundersen National Child Protection Training Center in Bentonville, Ark. Timothy Morris, assistant professor of mathematics, and five students from Math 391: Math Methods, Marie Jepsen, Audrey Julka, Austin Maercklein, Ariane Moore and Nicholas Theis, received training Nov. 12-13 at the National Council of Teachers of Mathematics Regional Conference in Minneapolis. Mark Singer, assistant professor of history, presented a paper, “Learning the Nature of the World: Liber de ordine creaturarum and Christian Instruction in Conversion-era Britain,” Oct. 1 at the 50th annual Northern Great Plains History Conference in Bismarck. Singer also commented on the panel, “Defining Identity through Diplomacy, Travel, and the Exchange of Ideas in the 5th to the 8th Centuries,” Nov. 6 at the Western Society for French History Forty-Third Conference in Chicago.